Comfortable & Budget accommodation:The hotel has 20 clean and pleasant private rooms , and each has its own en-suite bathroom and shower room. It has triple, quadruple, and up to 8 beds group en-suite available. In additional, we have the largest collection of shared dorms here in Amsterdam. We have dorms from 4 persons up to 20 persons!! Linens are prepared on all beds, and free shower towels are requested at reception. Nice atmospheric sport bar:The Globe is also best known for its sports bar, which is the biggest in the Red Light District and is open up to 3 o'clock in the morning (or 5 am in the weekend)!! You can view all major sport events (like the Premier League, European League, Super Bowl, N.F.L., N.B.A., & etc.) on 8 TV’s . There are also two pool tables and mini-football and one darts board for any exciting moments. In the bar, not only English or American breakfast is served, but also delicious lunch or dinner for you to order. Furthermore, there are Happy Hours running Sunday to Thursday in the bar, you and your friends can enjoy our offer of buying one Heineken draft and get another one free during these happy hours!! As hotel guest, you can enjoy lovely meals with 20% discount upon presentation of Hotel entry card. 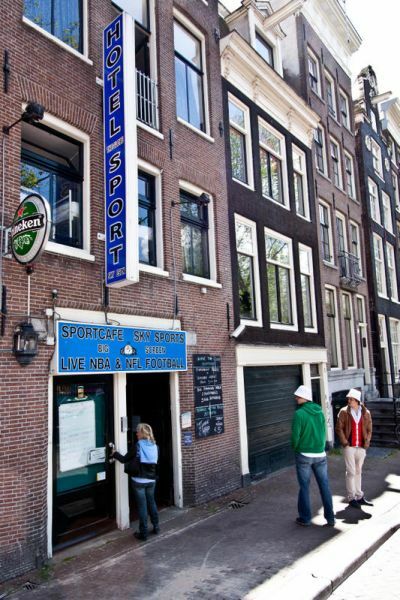 Hotel The Globe is centrally situated in the heart of Amsterdam. It is located close to the Red Light District and overlooks two of the most famous historic canals in “de Wallen”, the oldest part of the Amsterdam city. It is only 3 minute walk from Centraal Station, and less than 10 minutes walk from all of the major tourist attraction points, such as Dam Square, Flower Market, Shopping Streets, Rembrandt Square, Red Light District, and various Coffee Shops in the Centrum area. However, the Globe enjoys its quiet and easy neighborhood, as it is situated some distance away from the major tourist traffic.